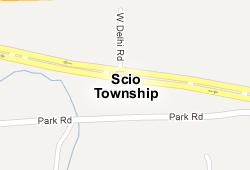 Scio Township, Michigan Real Estate and Community Info. Located in Washtenaw County, Michigan, the Township of Scio provides the perfect combination of small town comfort and city slicker amenities. With a modest population of just over 15,000, the Township of Scio is the kind of place where you can really get to know your neighbors. Buying a home in the Township of Scio means you can be sure a familiar face and friendly smile are easy to find. Plus, it’s just ten minutes west of Ann Arbor’s attractions and events, such as the Leslie Science and Nature Center, the Ann Arbor Film Festival and the Ann Arbor Summer Art Fair. Moreover, the University of Michigan, a top-tier university, supplies the area with college town perks—top-notch entertainment venues, outstanding NCAA sports including the nation’s largest football stadium, a thriving arts and culture scene, and a diverse community. Scio Township residents benefit from an abundance of high quality shopping and dining options, all within minutes from home. The Miller Road Park and Ride station makes it easy to spend the day in downtown Ann Arbor without worrying about downtown parking. Just hop on the 12 B line to visit the shops and restaurants in historic Kerrytown, with its old brick buildings, cobblestone walkways and old-time market feel. Then take a walk up Main Street and lose yourself in its eclectic boutiques, music venues and eateries. For a more traditional mall experience, visit the Briarwood Mall, which boasts a wide selection of brand name retailers, including Gap, Apple, Coldwater Creek, Hollister, Macy’s and JC Penny. Get in touch with the area’s German roots at Metzger’s Restaurant, which has been serving the best homemade German fare in the region since 1928. The natural beauty surrounding the Township of Scio is one of the many perks to buying Scio Township real estate. With no limit to the hiking, kayaking, mountain biking and boating opportunities, it’s not a question of what outdoor activities you can enjoy, but how much you can pack into a weekend! Ann Arbor and surrounding communities are fortunate to have some of the nicest parks around. Take a picnic to Delhi Metro Park or walk along the Dexter-Huron Metro Park Nature Trail and see what wildlife you can spot. Visit the Matthaei Botanical Gardens & Nichols Arboretum at the University of Michigan, and see just how Ann Arbor earns the word “arbor” in its name. For a lazy day on a lazy river, visit the Argo Canoe Livery, which allows visitors to explore the picturesque, tree-lined banks of the Huron River, either in a single-person kayak or a canoe built for two. Eighteen subdivisions comprise the Township of Scio: Arbor Point, Buena Vista, Country French Estates, The Glade, Killins Lakeview, Knights Farm Estates, Liberty Hills, Maple Creek, Parkridge Estates, Oakleigh Place, Polo Fields, Riverdale, Riverpines Estates, Saginaw Hills Estates, Scio Sunrise, Woodlea and Walnut Ridge. Many feature stunning views and access to pristine rivers and lakes. Killins Lakeview, for instance, is situated along the banks of Second Sister Lake and the mossy-covered trees of Dolph Park. Polo Fields provides an all-around golfers paradise, featuring the premium Polo Fields Country Club. Some subdivisions boast easy access to great shopping, such as Riverdale, while others are perfect for those commuting to Detroit via I-94, particularly Arbor Point. While some subdivisions cater to those looking for older homes built as far back as the 1920s, like Buena Vista, others provide homes built within the last decade, such as Scio Sunrise, for those seeking a thoroughly modern abode. Whether you are looking for a three or four story home close to one of Ann Arbor’s finest public schools, or a chic condominium perfect for the professional on the go, Scio Township real estate is diverse and sure to fit whatever needs you have. Ann Arbor Public Schools is the primary school district for the Township of Scio, though some residents in the northwest corner of the township are served by Dexter Community Schools. Washtenaw Community College is also close by, providing classes for students looking to go on to a four-year college and for community members looking to expand their knowledge or receive training for a new career path. For medical needs, St. Joseph Mercy Saline, one of the highest-rated hospitals in the region, is less than ten miles south of the Township of Scio, and provides quality service in a friendly atmosphere. The nationally prominent University of Michigan Medical Center, including its highly ranked C.S. Mott Children’s Hospital, is located in Ann Arbor. Scio Township real estate benefits from exceptional accessibility. Not only is it located at the nexus of I-94 and MI-14, but the Amtrak station in Ann Arbor is just minutes away, as is the Ann Arbor Municipal Airport. International flights leave daily from Detroit Metro Airport, which is a quick half-hour drive east from the Township of Scio.